Now THAT’S what I call extra lemon! Good job, Lizard’s Thicket! OK, first, I know I shouldn’t be drinking a jumbo (why do they have to call it “jumbo?” I ask for a large; they repeat it back to me as “jumbo”) sweet tea, in light of my current dietary goals. But set that aside, and allow me to give some props to the Lizard’s Thicket on Elmwood, for going above and beyond. I didn’t used to drink much sweet tea, because it was frankly too sweet for me. Then I discovered a couple of years back that I could tolerate any amount of sugar as long as there was enough lemon in it. And that, in fact, super-sweet tea with plenty of lemon was really good stuff. So — and yes, this is how bad habits start — I started ordering sweet tea “with extra lemon” instead of my usual water or unsweetened tea. But some restaurants have an odd idea of “extra lemon.” Sometimes I’ll get only a couple of slices — whereas “extra” is at least three, right? That’s how many I get when it’s self-serve — I don’t want to be greedy; I just want to offset the sweetness. 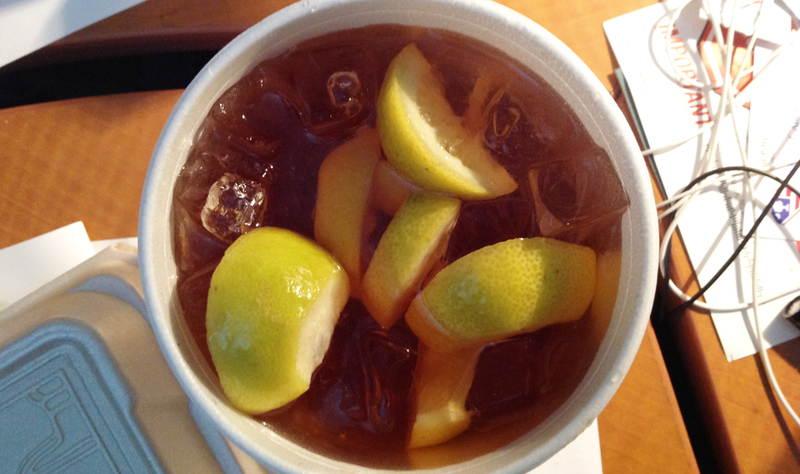 But today, the Lizard’s Thicket on Elmwood gave me tea with seven slices of lemon in it! More than twice as many as I would dare to grab for myself! This entry was posted in Confessional, Food and Drink, Health, Personal on September 10, 2015 by Brad Warthen. Congratulations. Citrus rinds are often one of the most bacteria-ridden surfaces in a restaurant. They may go unwashed, and never go through a sterilizing process the way green beans get steamed with salt pork. I need me some bacteria! Save me some money on probiotics! I mean, these ARE good bacteria, right? I mean, if I look at them under a microscope, they have little white hats, right?